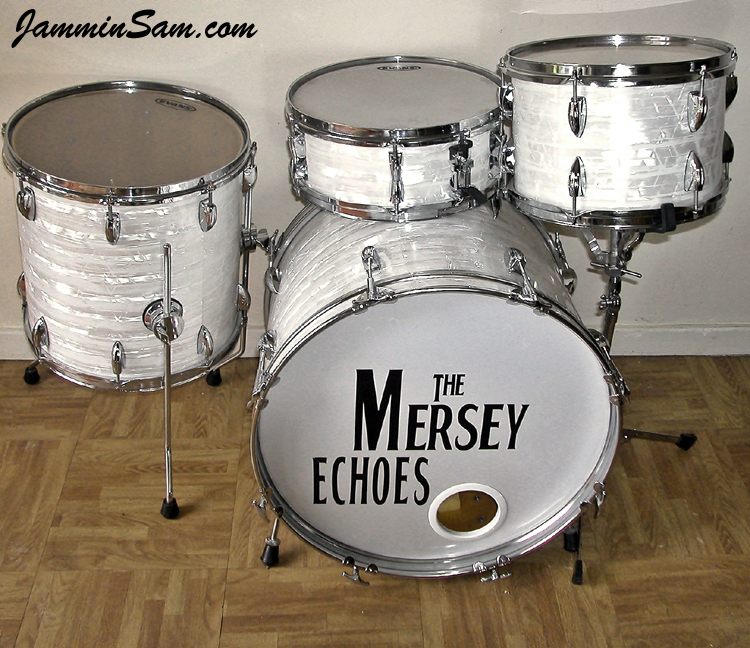 Pictures sent in (April 2012) by John Cotter from London, England of his drum set. Beautiful John! Well, where do I begin??? Whoa… what a very satisfied customer I am! Excellent service excellent material (& excellent fitting… well, according to the wife!). 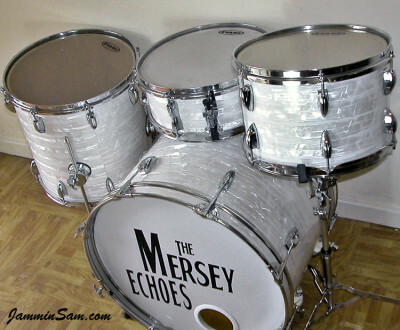 Being on a tight budget and needing a smaller “Downbeat” sized / vintage looking kit for the pubs & clubs we play mostly, I assembled some orphan drums for the project. The toms were from a Ludwig Accent Custom kit (as I wanted 12 x 8 & 14 x 14 toms rather than the modern deeper ones usually around). 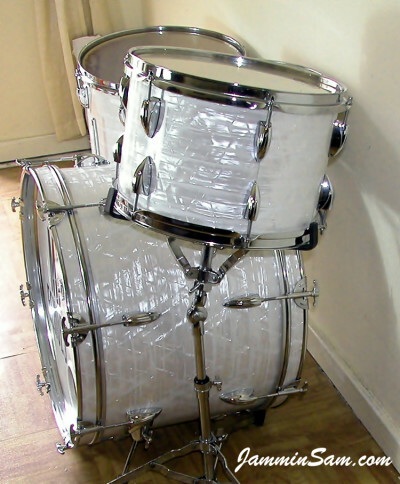 The kick was an Asian 20″ x 14″ and the snare a Yamaha Rydeen 13″ x 5″ which would give me a little more room behind the kit. While not being a virgin drum recoverer, I had done two kits before with the cheaper self-adhesive type wrap, albeit with less-than-perfect results (puckering/creasing, mainly). So I wanted to go the traditional route this time. As your other customers often state: the removal/refitting of all the hardware is the hard/time-consuming part! Clear instructions, exact cutting, and quality material. Well, the attached pix show the result! pretty good, I’d say! The guys in the band were impressed (more-so that I had done it all myself!). Looks great with coloured lights on stage. To recap: Love the one-2-one service, no rush just genuine old-fashioned service, and speedy delivery too. I like the way customers are encouraged to telephone rather than wade thro’ loads of “FAQ’s” on a website! (you never get the one that applies to you, anyway). Best wishes for your business.